I’m very honored to be a member of the Multicultural Kid Blogs. Together with 15 of our member blogs we are hosting the Second Annual Hispanic Heritage Month Blog Hop celebrating National Hispanic Heritage Month from September 15 through October 15. See details below for the chance to win prizes, and participate in our celebration. Also, through out this month I will have a special series called: “Discovering Our Taíno Ancestry.” This is the first installment of our series. We will be celebrating our Hispanic heritage, and teaching little one about his Taíno ancestry. This past summer we visited Puerto Rico. 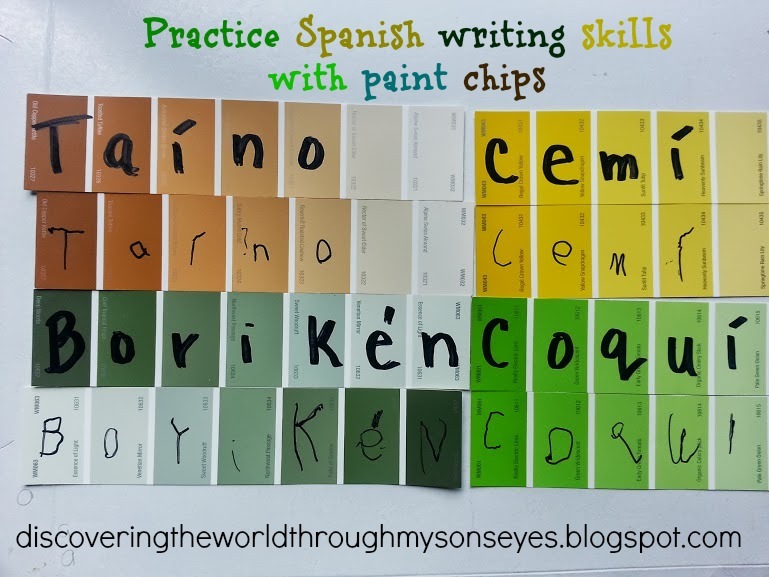 However, this visit was unlike any other it was our son’s first “real” Spanish immersion trip, and I was also on a quest to teach our son about his Taíno heritage. 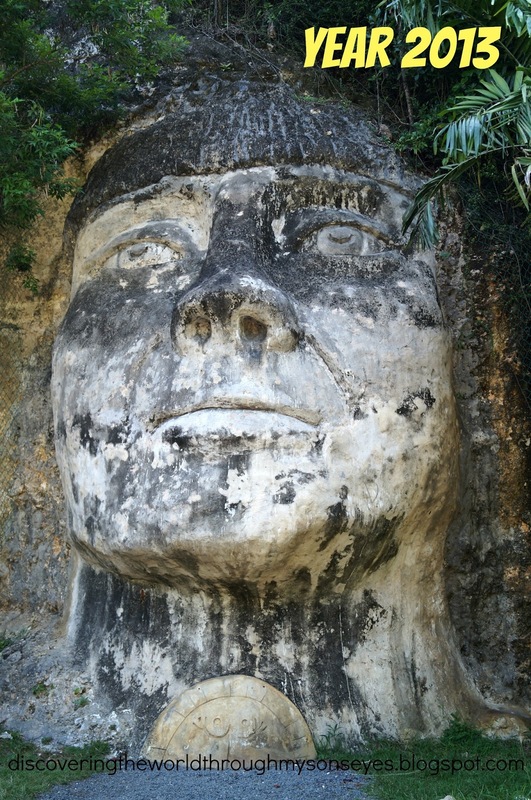 We had the opportunity to see “La Cara del Indio” it’s a rock sculpture of a Taíno indian located in the entrance of the town of Isabela and El Tunel de Guajataca. This impressive sculpture pays homage to the Cacique Mabodamaca who was a heroic chieftain from the 16th century who protected his people, and way of life from the European invaders. This sculpture is visible from the main road, and a vivid reminder of every Puerto Rican’s Taíno heritage. Taíno rock sculpture of Cacique Mabodamaca. Picture taken during our visit during the summer. La Cara del Indio. Rock sculpture of the Chieftain Mabodamaca. This picture was taken years ago when it was first sculpted. Between 2001 or 2002. Once home I focused on doing fun learning activities about the Taínos with little man. We read the book, On this Beautiful Island. 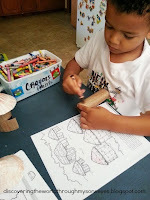 We also referenced the activity book Habláme de Puerto Rico. We also created a mini-sensory small village called yucayeque with bohíos, and a batey. The batey was a special plaza surrounded by stones with petroglyphs in which the Taínos celebrated their ceremonies and played the game bato with a ball made out of roots, herbs, and tree gum, and the areytos, a celebration of big events with music, dance, and story telling. For the mini-sensory village. We used rocks with petroglyphs that litle one made, and I had purchased in Puerto Rico Taíno figurines, and cemíes. Little one also made some bohíos, and we cut some greenery from the yard. 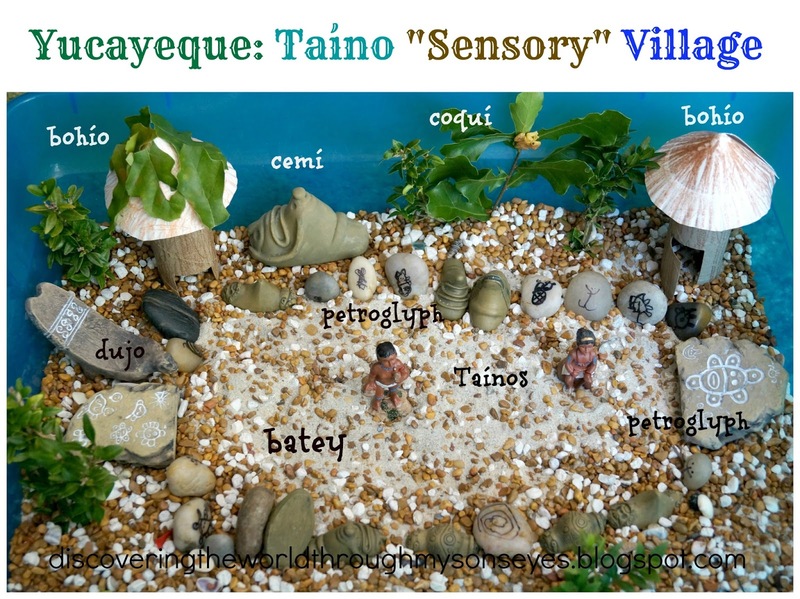 Little one also learned about the Taínos different social classes, and how they were divided. The nitaínos were the noble class, and this is where the chiefs or caciques came from. The cacique wore a guanín (a gold medal around his neck) as a symbol of his status. The bohíques were the priest, wise men, and doctors. The naborias were the lower class. They were the farmers, and fishermen. 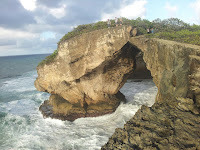 La Cueva del Indio, Arecibo, Puerto Rico. Photo courtesy of my niece’s mom Neyda Soto. 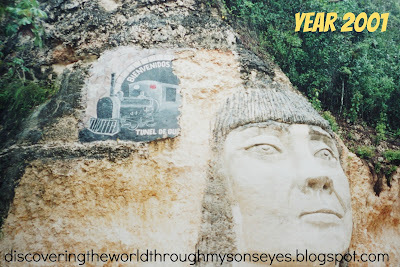 Hopefully, on our next trip to Puerto Rico little man will be older, and we’ll be able to visit la Cueva del Indio. It’s a rocky and not very comfortable walk. In our upcoming installments of “Discovering Our Taíno Ancestry” we will learn about the cemí, the coquí the unofficial mascot of Puerto Rico, do-it-yourself petroglyphs, and more! 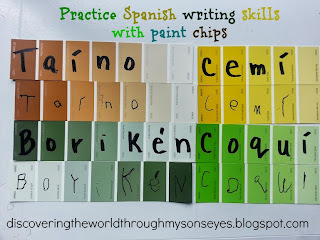 This post was part of the 2013 Annual Hispanic Heritage Month Blog Hop hosted by Multicultural Kid Blogs. What an amazing post! I learned so much already! 🙂 I really love the sensory bin you guys made…I love how hands-on your lessons are with your son. Can't wait for the next installment of the series! I also love that sensory bin! I'm so glad you had such a wonderful trip and that you are continuing the learning at home. 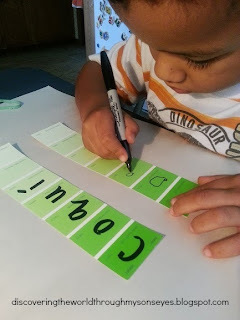 I'm pinning this – I want to get that book and try some of your activities in our homeschool. Oh my goodness, your sensory village is amazing! Thanks for sharing this fascinating bit of history. This is a very impressive village! Love it! Such a meaningful learning! The yucayeque was fascinating, as well as the sculpture of Mabodamaca. I've done some research on the Tainos and have written a couple of historical fiction novellas about them. There is so little we know about the people who greeted the Spaniards and were extremely hospitable to them. But we're beginning to dig up more and more facts about them. I have learned some about them but am still doing research. Thanks to you, I learned about Mabodamaca, the great casique of Boriken. I think he must have a been contemporary of the great Agueybana. Thanks for a great blog! True, there is so much more to learn about the Taínos. I'm hoping to visit Puerto Rico soon to visit with my son and husband Tibes Indigenous Ceremonial Center and I'll be writing about it as well. Donald, you have peaked my interest on the novelas you have written, and on your research. Thanks for stopping by! Also, how did you find my teeny li'l blog? Just curious. 🙂 Thanks again!